Note: Clinique.com allows you to enter only one offer code per order. Choose wisely. 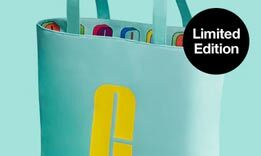 Spend $65 or more on the Clinique website and receive this roomy, lightweight, limited edition tote bag. 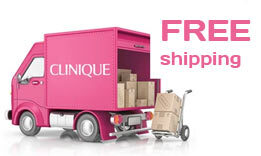 Clinique offers free shipping with any $50+ purchase. Enter this offer code and enjoy free Standard Shipping (save $6) with no minimum spend. Don’t forget to shop on Clinique.com via Ebates (just go through the link) and you will automatically get 4% cashback credited back on your PayPal account. Where to enter the Clinique coupons? 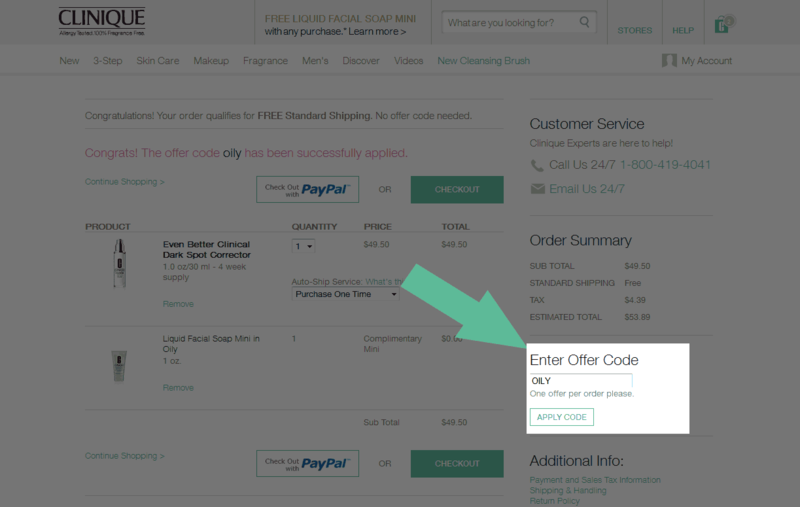 Simply add any items into your shopping bag, click on it (view cart) and find “Enter Offer Code” field at the right bottom. Enter the code there (usually they are written in CAPITAL LETTERS) and hit the button “Apply code“. You will immediately find out if the promo code is active or not. Code: GREATSKIN – With any $25 Clinique for men purchase receive a free full size 2 in 1 skin hydrator + beard conditioner. Code: BRIGHT – Spend $40 or more on Clinique.com and receive this exclusive 5-piece kit for brighter and more luminous skin. Codes: PEPUP or PINK – Spend $45 or more on Clinique and choose your free set including 6+1 item. A $75 value. Codes: TRUELOVE or LETSFLIRT – you could choose a free kit with any $45 purchase. Code: LUNARJOY – Free brilliant red sleeve with any clinique iD purchase. This promo was active during the Lunar New Year. Code: HANDSOME – Receive free trio – Clinique For Men™ Broad Spectrum SPF 21 Moisturizer Mini, Clinique For Men™ Face Scrub Mini, Clinique For Men Maximum Hydrator Activated Water-Gel Concentrate Mini. Yours with selected purchase. Code: DETOX – Deep-clean skin – free with any $40 purchase. Code: 25OFF – 25% OFF for smart rewards member + 5X Points. Code: HAPPYTOTE – With any $55+ purchase on Clinique.com receive this tote (15″L x 4″W x 13″H). Vibrant color, roomy design. Codes: MORETREATS or ALLTREATS – these codes were valid during the bonus time on Clinique.com and you could get 2 step up gifts. Code: DRYSKIN or OILYSKIN – Receive 3-Step Travel Kit either for skin types 1 & 2 or 3 & 4. Free with any $45 purchase. Codes: HAPPYDUO or BERRYDUO – You could choose free full size duo (including Happy Gelato Cream for Body plus Happy Gelato Cream for Hands in Happy or Berry Blush) with any $65 purchase. Code: SUMMERTOTE – Receive a free 6-piece Clinique gift when you spend $45 or more. This offer was not visible on the website, but you could redeem it by using the coupon. Code: 2DELUXE – Spend $55 and add two deluxe samples – Take The Day Off™ Makeup Remover For Lids, Lashes & Lips 50ml and Moisture Surge Face Spray Mini, 30ml. Code: LETSGO – with any $40 purchase receive this kit including Turnaround Revitalizing Daytime Moisturizer Mini in Rosy Glow, Chubby Intense Mini in Broadest Berry, Take The Day Off Cleansing Balm 15ml and CliniqueFIT™ Workout 24-Hour Mascara Mini. Code: BLISS – Receive 4 Clinique freebies with any $45+ purchase and get ready for the upcoming wedding season. Code: SPRINGDUO – Spend $40 or more and get 2 free minis: High Impact Mascara Mini in Black and Chubby Intense Mini in Broadest Berry. Code: REPRESH – free spring refresh kit including a foundation with your $40 purchase and enjoy a free 3-step kit (Almost Lipstick Mini in Black Honey, Take the Day Off™ Makeup Remover Mini, Moisture Surge Extended Thirst Relief Mini, Quickliner™ For Eyes Intense Mini in Intense Ebony). Code: LIPXLASH – With any $30 purchase – receive this lip & lash duo for quick lash + lip touch-ups anytime, anywhere. Codes: 2XSMART or 3XSMART – Free de-aging duo when you spend $45. Spend $65 and also add Clinique smart night custom repair moisturizer. Code: WINTER – A free Skin Savers Kit including 4 Clinique must-have for Winter season. Yours with $45 purchase. Code: EYEKIT – Free 4-pc makeup kit (including mascara, eye cream, Quickliner for eyes, makeup remover) with any $35 purchase. Codes: ORANGE or GREEN or YELLOW – you could choose from 3 workout bags with any 2 or more CliniqueFit products. Code: TOTE – A free silver tote, green inside – yours when you spend $55 or more and enter this code. Code: PARTYLIPS – Add a free full-size Pretty Easy Lip Palette with any $55 order. Code: TOTE – Free Tote bag – enter this code when your order exceeds $55. Code: SMARTDUO – With any $55 purchase receive Potent serum + eye treatment. This duo targets all major signs of aging. Code: TAKE2 – Free duo with purchase – spend $35 or more and receive 2 Take The Day Off minis. Codes: SUMMER or PRETTY – Travel kits for the last days of the season. Get one free when you spend $40 or more. Code: WAKEUP – free minis for your morning routine: Liquid Facial Soap in Mild, Pep-Start HydroBlur Moisturizer, Pep-Start™ Eye Cream. Code: OILY or DRY – Each kit includes 3 minis (All about eyes, 7 day scrubcream, Moisture Surge). To qualify you had to spend $35. Code: MOON15 – never bought anything from Clinique online? You could enter this code to get an extra 15% OFF your first order + free standard shipping. Code: GLAM – A free 4-pc instant glam kit – free with $35+ purchase. Codes: AROMATICS or TRIO – You could receive 2 Aromatics fragrance minis (free with $40 purchase) and also receive Aromatics Elixir (with $55 purchase). Code: TRICKS – This quick kit includes 4 must-have minis for Halloween. Code: LIFT – Elevate your skin to a plumper version of itself with this free deluxe Sculptwear mini with any $55 purchase. Code: BOLD -you could get Bold & Bright Kit including 3 minis. Codes: SKINCARE or MAKEUP – you could choose your Fall Kickoff Kit with any $40+ purchase and receive Mini Skin Care Trio or Mini Makeup Trio. Code: FRESH – you could get a Pretty Kit (including Pep Start Eye Cream, Superprimer Universal Face Primer, Superbalm Moisturizing Gloss) – free with any $35 or more purchase. Code: WOW – free Wow Kit including Turnaround Revitalizing Lotion + Mascara + Almost Lipstick in Black Honey free with $65 purchase. Codes: GEL or LOTION or CREAM – you could choose your moisturizer + get Chubby Stick for lips in Mega Melon. Code: HITS – A free summer hits kit including Soothing Shine, Humidity-proof Lashes, Easy Eye Shadow. Code: TREATS – Get Clinique Smart mini + a cosmetic bag – free with any $65 purchase. The Clinique web sight is most difficult! I chose several items to purchase, there wasn’t any place I could find, to check-out. I then called to place my order by phone, I have now been holding for 15 minutes.. The code they showed online for Cyber Monday they now say expired on Nov. 23rd. I tried placing my order on cyber Monday! I agree. I missed the time they gave out brushes in their free gifts. I have spent $143 and was not able to receive the tote bag for 65 and the cosmetic case for spending 100. I am disappointed because I left the store to come home to order on line because it was not available in store. the makeup bag with the code SPRING comes up as an ‘exclusive mystery bag’ on the canadian site, do you know what sorts of things are usually inside those? can i use more than one code at checkout ? no, only one code per order. I love all your make up and the dramatically different moisturizing. I wish you still had the alabaster breeze foundation. It made my wrinkles disappear and my skin fresh at age 67. THANK YOU SO MUCH!!!!! Jan Worstell. Please e mail all your specials. Skin works on 8/2/2014 🙂 Just got free shipping. Code THANKS doesn’t work on January 8. Coupon codes ‘TOWEL’ and ‘MED’ appear to no longer be valid. Created a mock $61 order and tried to apply each code. CONGRATS! THE OFFER CODE TOWEL HAS BEEN SUCCESSFULLY APPLIED. Sorry, Summer In Clinique Towel – provided by offer code towel is no longer available. “Sorry, Summer In Clinique Flip Flops – Medium provided by offer code med is no longer available. Just used the travel code:) TY!! I am thinking of trying the self tanning lotion that has recently been advertised. My question is : I am allergic to IVP dyes and Cat scan dye..Is there any type ingredient in the self tanning products that could be an issue for me? Hi, I am sorry but I don’t have such information.